A must-have tool for any grill master, this five-piece BBQ Ninja is bound to come in handy during the next cookout! 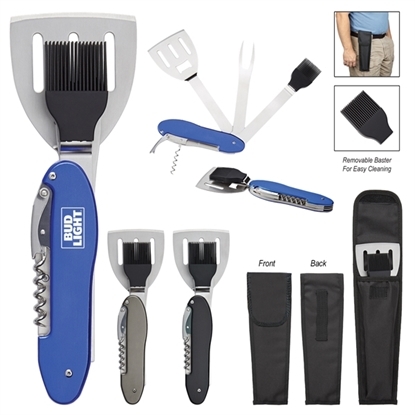 Measuring 11" and available in several colors, this all-in-one tool features a spatula, fork, brush, bottle opener and corkscrew, and they all fold away for safe storage. It comes with a travel bag with hook-and-loop closure so you can take it with you wherever you go. It is FDA approved and can be customized with an imprint of your company logo and message for heightened brand awareness on a memorable gift. Mypromotionalpens.com offers the largest and best priced selection in Promotional Spatulas & Spreaders. We will price compete and we won't be under sold. Let our graphic designers make your personalized Spatulas & Spreaders standout above the crowd at no charge. We won't stop until you are completely satisfied with your custom Spatulas & Spreaders art proof.Use category search filters on your left to help narrow your search to find exactly what you are looking for.